It's October 1st, and if you didn't see my post yesterday you might not know what is going on. 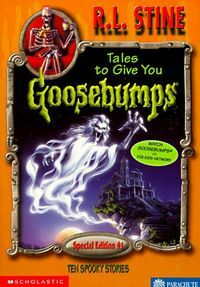 Each day in October I'm reviewing a different short story in the Goosebumps collection 30 Tales to Give You Goosebumps. Today's story is "The House of No Return." Meet Robbie, Nathan, and Lori. They are members of the prestigious Danger Club, for those who love the dangerous lifestyle. Of course a club of 3 people isn't really much of a club. That is why they are recruiting. So how do you join? Well, to prove you live the danger lifestyle you must spend the an hour at night in an old abandoned house alone. A house that is rumored to be HAUNTED. How scary is it? Well potential Danger Club member Doug could only last about 10 minutes before he ran screaming from the house! On to the next victim potential member. Enter Chris Wakely. He's pretty new to school and hasn't made a lot of friends yet. Surely he would be eager to join the Danger Club. Just one problem, he is a huge coward. He even openly admits it. This calls for a plan! A dastardly plan. The club conspires to take Chris trick or treating with them on Halloween. Unfortunately it is more trick than treat. They take him to the haunted house and shut him in there. Of course they are fully convinced he'll love the experience and be a happy member of their club at the end. I am not sure what about Chris's begging and pleading gave them that idea. Here is the thing though, he actually lasts the hour... but then more time passes by and he still doesn't come out. The Danger Club try to go in and get him to congratulate him but the door won't budge. Never fear, they can go in through the back door. Of course, none of the Danger Club has ever been inside. See since they were the founders they already know THEY were brave so what would be the point. Nerves tense, they finally open the back door. They call out for Chris to no avail. The door slams behind them. Strange lights appear at the top of the stairs and come closer. 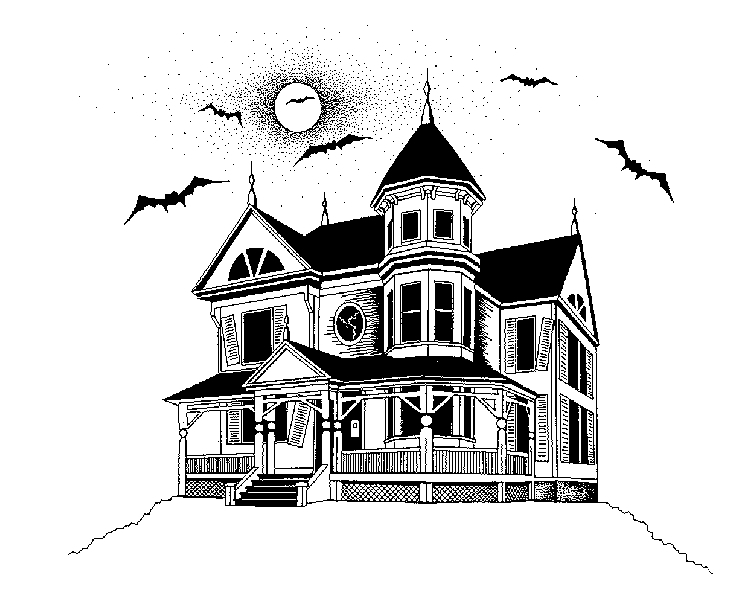 This house IS haunted, and two ghosts greet them. Where is Chris? The ghosts have an answer. He left out the back door awhile ago. They didn't want to let him go, but he promised them that 3 more kids would come in and take his place. Now they have. The Danger Club will get to stay in the house... FOREVER! This is my first ever Tales to Give You Goosebumps story. I was not quite sure what his short stories would be like. How similar would they be compared to a full length story? The fact is, naturally it is pretty similar. I mean I guess it would be silly for these books to be absolutely different. The tone is very much the same as your standard book. It's still got the tween kids who love pranks and stuff. R.L. Stine's narrative voice seems intact as always. There are some differences though. A lot less fake out scares for one thing. Without chapters, there is no need for the "chapter cliffhanger" where some doom is impending only to turn out to be nothing. It also lets them keep the surprise terror for the very end, since there are only like a dozen pages to read through. It makes a "punchline" ending like this one work effectively. The House of No Return starts off the book well. The Danger Club establishes a love for horror, and the Halloween antics make it an ideal story to read this month. Haunted House stories are classic and while this doesn't break a lot of fresh ground as a story it is pretty fun. The ending did actually make me chuckle. It might even be enough to make a young 9 year old think twice before ringing the doorbell and that creepy house in the neighborhood this October 31st. Now be sure to check back tomorrow for Tale to Give You Goosebumps #2 "Teacher's Pet"